Who are the New Heroes? 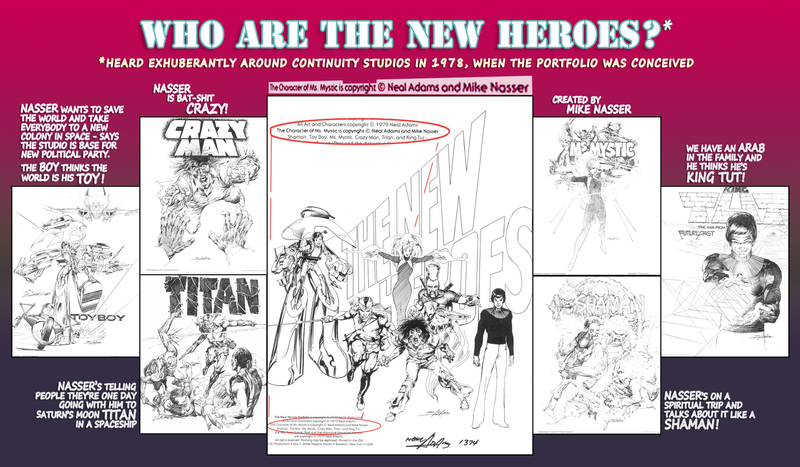 Neal Adams’ New Heroes Portfolio, conceived in the summer of 1978, was the first (and perhaps last) time that Adams entered into a co-creator partnership of a comics property with another artist. In his recent responses to my claims of creating the character and partnering with him on it later, Adams failed to satisfactorily explain the appearance of Ms. Mystic in the DC’s Superman/Ali book. The more striking presence, however, of co-creation credits for Ms. Mystic, as copyrighted by Neal and myself, in this portfolio, has so far remained without a public response. He has never publicly repeated the lame story and perjured affidavit in court about it being a printer’s mistake. For the record, however, there is more intrigue to the story between us, in the portfolio, than simply the co-creation credits for Ms. Mystic. When I made the first trip to California in November 1977, and returned with a new direction and ambition for my life and art, it was a very big deal for Neal. I was a big hope for him. Not only as a developing artist with a growing portfolio of comics projects that strongly supported his own professional and creative choices – but I was also entirely dedicated to the moral position he took for comics creators (before I understood that for Neal it was more of a posture than actual substance). For me to embark on a course that was straying away from comics, drove Neal to make a concerted effort to compel me to remain in the medium. By the time I returned from the second trip to California in late 1978, the portfolio was already published. The first thing he wanted to show me was the art for the 6 characters in it. He said he hopes this will help me get back to drawing comics and pursuing my ambitions through them. The following graph reveals the inspiration my journey held for Neal at the time, mainly evident in the names he gave to each of the characters. It is not only the Ms. Mystic crediting that attaches my name to this portfolio. All of the characters in it were inspired by the grandiose new aspirations I was pursuing, which were admittedly a little “crazy”, even for the hub of superhero makers of that time. Why is Deadman in Ms. Mystic #1?